The online version of this article ( https://doi.org/10.1186/s40560-019-0375-3) contains supplementary material, which is available to authorized users. The need to address medical overuse, defined as “the provision of medical services for which the potential for harm exceeds the potential for benefit” , is increasingly being recognized by healthcare systems internationally [2, 3, 4, 5]. In 2012, the Joint Commission on medical overuse in the USA identified a list of the top five overused medical procedures based on available evidence and expert-recommended standards of appropriateness ; among those listed was the over-transfusion of blood and blood products, such as red blood cells (RBCs). Allogeneic RBC transfusion is a common procedure for many medical and surgical specialties and is typically used to manage hemorrhagic or anemic events among hospitalized patients [7, 8, 9, 10, 11]. However, with the risks of infection or even mortality associated with RBC transfusions, overuse is of significant concern for patient safety and quality of care [12, 13]. Beyond this, blood products are costly resources and are limited in their availability; current estimates suggest that acquisition and administration costs for RBC transfusions range internationally from $500 to $1200 USD per RBC unit transfused . Blood conservation is, therefore, additionally important to maintaining financial stewardship in healthcare systems worldwide. To guide appropriate use of RBC transfusion, clinical guidelines such as those from the AABB (formerly the American Association of Blood Banks)  have developed evidence-based recommendations predicated on set pre-transfusion hemoglobin concentration values. For example, for most stable, non-bleeding hospitalized patients, including those admitted to the intensive care unit (ICU), RBC transfusions are not recommended above a hemoglobin level of 70 g/L . Informing such recommendations are a number of randomized controlled trials (RCTs) that have examined the efficacy of a restrictive (e.g., hemoglobin value of 70 g/L) versus a liberal transfusion strategy (e.g., hemoglobin value of 100 g/L). [16, 17, 18, 19, 20]. 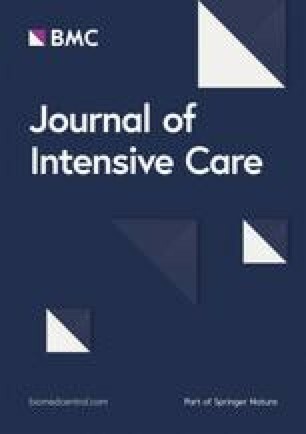 A recent systematic review of 31 RCTs found that, with the exception of certain high-risk groups (i.e., neurological injury or disorders, acute coronary syndrome), a restrictive transfusion strategy decreased transfusion requirements without increasing the risk of mortality and adverse outcomes for most hospitalized patients . We specifically sought to examine RBC transfusions among critically ill patients for whom a restrictive transfusion strategy is supported by the most current, high-quality evidence [16, 17, 18, 19, 20, 21]. In doing so, we acknowledged that a restrictive pre-transfusion hemoglobin threshold will not apply in all clinical situations. For instance, in some hemorrhagic or ischemic events, clinical judgment should subvert laboratory value-based thresholds. 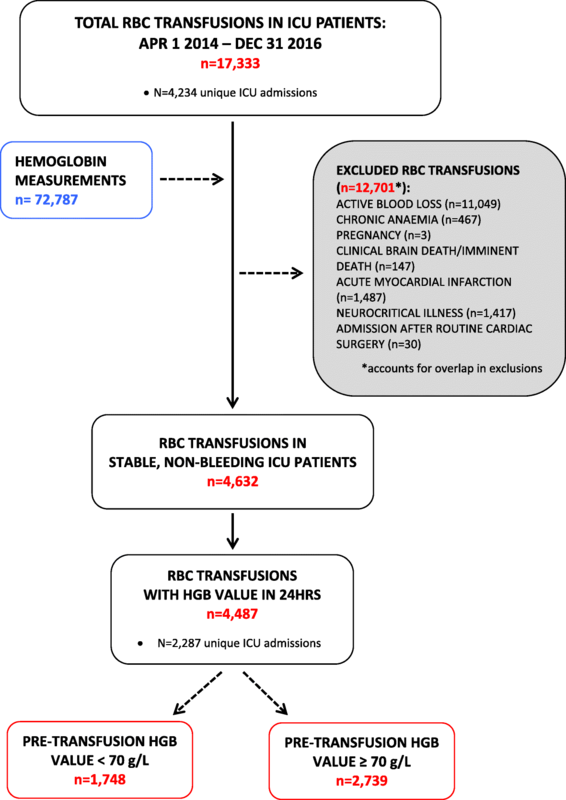 To account for such reasonable clinical exclusions, we excluded from analysis a considerable number of patients (i.e., greater than 50% of ICU admissions with a RBC transfusion event) for whom a restrictive transfusion strategy has not been proven safe, nor superior, to a liberal transfusion strategy (e.g., chronic anemia, active blood loss, acute coronary syndrome, myocardial infarction, and neurological or traumatic brain injury) . With our final cohort, we, therefore, aimed to decrease the potential for misclassifying a RBC transfusion event—for which a restrictive transfusion approach would not be appropriate—and allowed a conservative evaluation of RBC transfusion practices in the ICU. Similar studies examining the appropriateness of RBC transfusion practices have been described in the literature. Previous retrospective audits, for example, have primarily focused on characterizing mean pre-transfusion hemoglobin levels and found them to range substantially between 71 g/L and 91 g/L for most non-hemorrhagic, ICU patient populations [31, 32, 33, 34]. One of the larger studies conducted in the USA, a longitudinal analysis RBC transfusion practice between 1997 and 2007, reported a similar mean pre-transfusion hemoglobin level to our patient cohort after their 10 year follow-up period (significantly decreasing from 79 ± 1.3 to 73 ± 1.3 g/L) . In addition, Netzer et al. observed a significant decrease in the proportion of patients who were transfused at a hemoglobin level of less than 70 g/L. In contrast, studies that have examined average transfusion volumes have reported higher numbers of RBC units per transfusion event compared to our study results, ranging from 2 to 4.3 RBC units [32, 35]. While it is difficult to reconcile specific reasons for observed differences between these previous studies and our present findings, some differences are likely attributable to variations in the patient case-mix, ICU structure or culture, or even the time since the publication (and acceptance) of seminal and relevant literature and guidelines.